There are few canned items that are nutritionally-dense. Canned fish is nutrient-dense in fish oils and omega 3s. 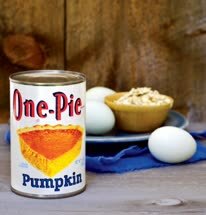 Pumpkin is one of the very few vegetables that increases in nutrient-density with the heat from canning. In most cases the heat kills the enzymes and reduces vitamin content along with killing bacteria. In the case of pumpkin, the sterilizing heat converts more of the vitamin A into an absorbable form, raising the vitamin content.